In the interest of marital harmony, there are two things a husband should never try to teach his wife: driving and fly fishing..
For women seeking to learn outdoor sports, this potential threat to romantic bliss can be avoided through women-only outdoor skill classes. Why women-only classes? Men and women learn differently. Women take a “why do you do it this way?” approach to learning. Men–who want to catch the biggest fish or shoot the winning score prefer a results-oriented approach. Even if the instructor is male, the women-only class structure helps address other barriers to female participation. These include the image of hunting and fishing as exclusively male sports, the isolation many females feel they face in tackling these pursuites, and the lack of feminine role models. The Becoming an Outdoors Woman (BOW) program, operated through state wildlife agencies, is available in most states and provinces. It follows a two-day format that includes meals, lodging, equipment and instruction (with a choice of several beginning seminars) rolled into one low price. Activities offered often have a local twist, but may include shooting, archery, orienteering, nature photography, survival skills, motorboat handling (Alabama) beginning moose hunting (Alaska), talking to animals and field dressing (Saskatchewan). Beyond BOW classes are offered in some areas to help graduates further hone their skills. The National Wild Turkey Federation launched its Women in the Outdoors program last year. It follows a similar format, but additionally offers the networking support of its chapter structure to help keep in touch with these novice outdoors women. The National Rifle Association’s Women’s Issues Dept. 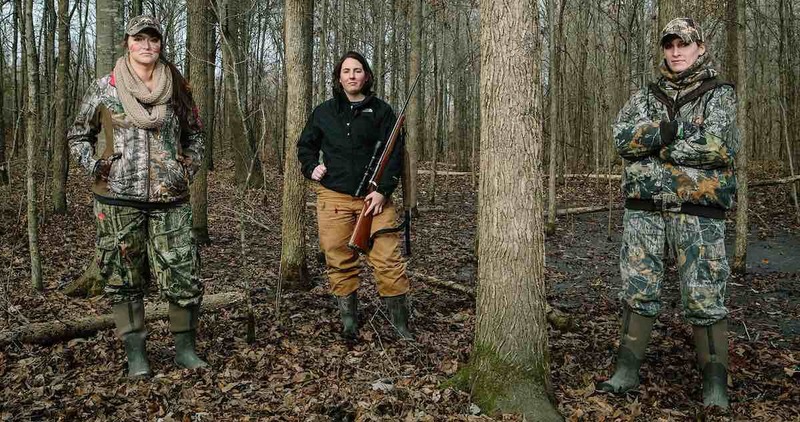 now offers hunts especially for women, and has a state-by-state list of women hunters. The ability to connect and communicate with to other hunters is a key to continued participation. This is true for for women and men alike. The Women’s Shooting Sports Foundation offers women’s shooting events held throughout the country. These events are geared to beginning shooters. Local volunteer organizers may choose a to hole handgun, shotgun or rifle-shooting events. Many women travel to other states to participate part in these programs. Women-only classes give each the beginner the comforting support of her sister shooters. This helps her avoid the kind of discomfort a guy would feel at a Mary Kay party.